All good cognac producers have a paradise, the locked part of the cellar, in which they mature the best and oldest cognac. 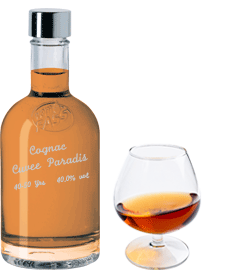 Gérard Seguinot, a producer of the finest Cognac in the Grande Champagne, released this rare cognac from his own paradise. Enjoy this outstanding and remarkable spirit! This Cognac is also classified as “Premier Cru” or “Cognac Grande Champagne”. This means that the Cognac exclusively uses grapes from the best growing area of Cognac. This ranking, right at the top of the Cognac Hierarchy, is due to the soil’s traits according to quality studies from experts.